This week everybody’s weighed in on whether NewSouth Books should have edited the n word out of Huck Finn, so I’ll add to the cacophony by hailing Dr. Churchwell’s brilliant first statement and plumbing a topic that gets lost in this debate. How do we teach difficult texts? Sometimes when we read literary works from another era, we may find the language to be archaic, biased, or strong. We may even be offended by the diction and the attitudes it represents because the language reminds us of horrible injustices and past crimes. Such language may cause problems for modern readers who don’t comprehend the setting of another era or who would rather not explore the prejudices and problems of that time. In other words, reading a work from such an era can be contentious. 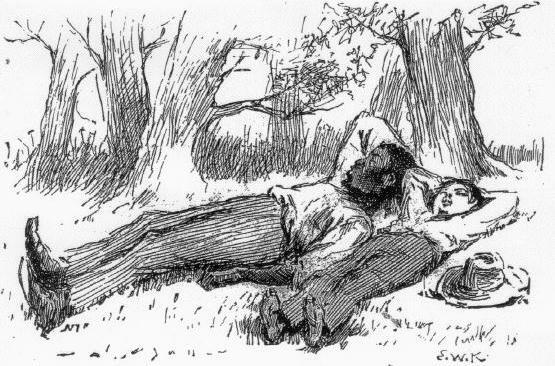 For example, the Adventures of Huckleberry Finn, written in the late 1800s by Mark Twain, takes place in the Southern United States. Some of its language is considered racially inappropriate and offensive today. While we would never consider using such terms today, Americans from certain regions of the country once did, and that language is key to the setting Twain establishes in his story. Let’s get a sense of how you will be challenged. You have to imagine a time that is drastically different from your present-day experience, and yet, familiar in some ways. Huck Finn is set in 1835-1845, when African-Americans are enslaved in parts of the United States, and the country has not yet fought the Civil War—a war fought over slavery and other economic, political, and social concerns. Try to picture a time in America when race relations were so bad that it would be commonplace for a white man to claim how wrong it was for a black man to be educated, wealthy, and have a vote. If you would like to see how we ask students to investigate a particular racist rant by Pap, Huck’s father, begin on page 14 of this sample lesson. These words are only a snapshot of myriad ways I’ve introduced and taught works with antiquated, offensive language. I’ve started with slide shows of civil rights history so students can see how long and hard people fought for freedoms in the United States, so that the work being studied–in this case To Kill a Mockingbird, rife with the n word–could be placed in a positive, progressive context. When I say “progressive,” I mean inspirational to any student whose ancestors may have fought for basic rights. An aside: If students only read works where people of certain races, religions, ethnicities, and sexual orientations are always enslaved, oppressed, or secondary characters, we’re giving kids a narrow, myopic lens on diversity and achievements. In other words, Jim of Huck Finn and Tom of To Kill a Mockingbird shouldn’t be the only black men teens encounter in English class. I’m all for Huck Finn mixed in with contemporary works. Someone might argue that I, who am against censorship, have censored myself in this post. Of course I have. I am a white American woman born in 1968 who refuses to use the n word. Place me in my historical context, get to know me a little, and you’ll soon learn why I have no desire nor right to use that word casually. If I write about a character who happens to be racist or happens to be black, it’s possible I’ll include the entire word spelled out in that context. But only then. It’s also helpful to present students with that civil rights timeline but first as just a series of dates, no events, and ask them where their births, their parents’, and their grandparents’ fall. It’s interesting to see their faces after you post historical events, when they begin to see who in their family was alive when Jim Crow was still around, when lynchings were still the regular, when Dr. King was assassinated. Suddenly racism isn’t the mere stuff of dusty history tomes. Suddenly it’s harder to argue that racism is dead and that the n word is everyone’s to use…especially harder for those who don’t realize they’re waking up white. My students have learned the art of argumentation while debating whether works such as Heart of Darkness should be removed from the canon. My students have written private journals about racial epithets and other violent words they have used or others have used against them. There are so many creative, compassionate, and courageous ways to teach the ugly truths of human history and the malignant desires of the human heart. Millie Davis of the National Council of Teachers of English, which calls the NewSouth edition censorship, notes this is not a book you read aloud. I would agree, having discussed with my students how we will skip this word when reading sections of Heart of Darkness in class. No matter how racially heterogeneous your classroom is, it just doesn’t make sense to let those words fall on student ears. Maybe someday, the word will be so innocuous that anyone can say it the same way they might say “knave” or “varlet” when reading Shakespeare. By the time students are 12 or 13, they should be led thoughtfully and sensitively through these dark topics by both parents and professionals. School is a place to practice habits of good character. As Churchwell says, let’s not interfere with the study of Huck’s moral development by cleaning up the rough, ignorant, historically real language Twain gives him. No, I won’t pretend my heart doesn’t beat faster before I embark on such lessons, or that I haven’t pulled students aside and asked them to let me know if they feel like things are too disturbing. Teaching tough works is messy. You have to be ready for a range of feelings to be expressed by everyone in the community. You have to listen. And what Mark Twain’s Huck, Jim, Pap, and others have to say–in all their splendid ignorance, with all their courage, and with all their beauty and warts–is worth giving a gander to. Or, we can all follow Huck’s example in Chapter 1, before the adventures have schooled him the wiser, and hide our heads from history. …but by and by she let it out that Moses had been dead a considerable long time; so then I didn’t care no more about him, because I don’t take no stock in dead people. — What books won’t you teach? Why? — What types of topics are your students ready to handle? How do you know? — How do you prepare your students for difficult topics and words? — What words have you or others close to you been called that are extremely hurtful? What do those words mean to you? How do they affect your feelings and your actions? What choices did you make after hearing these words? Why? — What words have you called others that you now regret? Why? — Should literature we read in school contain those words? Why or why not? — Should literature with such words be banned from the canon? Why or why not? — Should literature with such words be edited so that synonyms are used? If yes, what synonyms would you use, and why? If not, why not use synonyms? Amen, sister! We may not be making it unanimous in writing that this approach to Twain is ill-advised, but I’m glad for the outcry against the book. In fact you should send this to the White House. Thanks! I’m also glad that the public cares this deeply about our literature to discuss it via FB, Twitter, many social networking outlets as well as news media. Intellect is still alive and well in America!